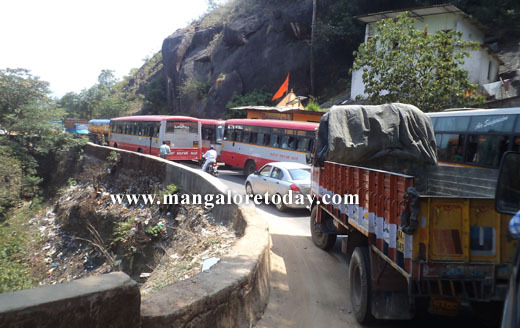 Charmadi, April 06, 2015: Vehicles negotiating Charmadi Ghat, as alternative route between Bengaluru and Mangaluru, virtually came to a halt for more than four hours after an axle of a lorry broke down in the early hours of April 6. The traffic congestion caused serious inconvenience and danger to public. At least 300 lorries move from Dakshina Kannada to Bengaluru on Charmadi Ghat daily. The axle of a lorry broke down on the 10th cross at the Ghat. Banakal police station officer Shivakumar and Kottigehara Geleyara Balaga team visited the spot and made way for the movement of vehicles after they came to know about the blockage. Vehicles in a rush failed to follow lane discipline causing chaos. The high vehicles numbers on the Charmadi Ghat stretch due to the diversion is causing frequent traffic pile up said an eye witness. Vehicles are jammed in the traffic at the seventh curve on the Charmadi Ghat. People and particularly kids in vehicles standing still face a difficult situation. . The district administration should deploy squads on the ghats to clear the traffic when the density of vehicles is high on the stretch, say most road users.